Two compact Nissans as the SUV-pocalypse’s latest victims, Dieselgate troubles, a Faraday Future delay and more await you in The Morning Shift for Wednesday, Sept. 12, 2018. The global SUV and crossover craze have claimed two more victims. This time, it’s two Nissans that are only sold in Europe. 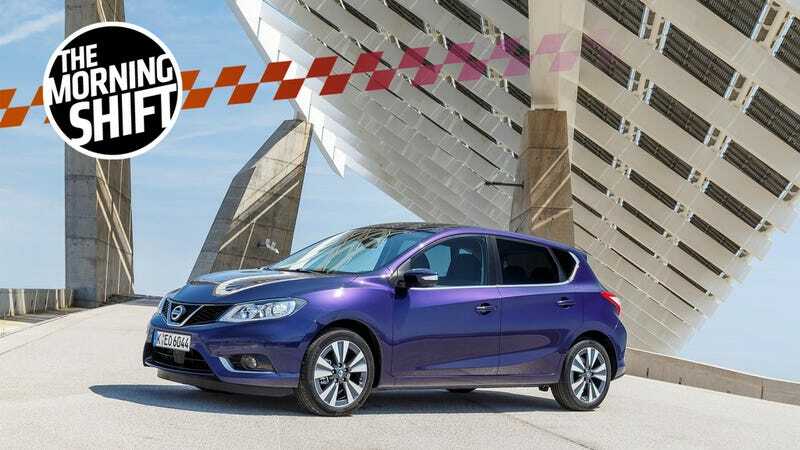 In June, Nissan ended production of the Pulsar hatch in Europe. It will also stop building the Almera sedan in Russia soon. The automaker has said that a “consumer swing away toward SUVs” is the reason, reports Automotive News Europe. This is my surprised face. The decision was made in response to “a rapidly increasing switch by European customers from traditional vehicle segments to crossovers,” Nissan said in a statement. “The story in Russia is similar,” a spokesman said. The electric Leaf is the only remaining non-SUV compact car sold by Nissan in Europe. Nissan, then, sounds like it’s following the Ford trend of killing off small cars and chasing those sweet SUV profits. The Almera was a model exclusive to Russia and was actually the Japanese automaker’s top-seller there in 2014. Now that it’s being phased out, the current Nissan lineup in Russia will be made up of only SUVs and the GT-R. Talk about extremes. Now, I’m not saying that the Almera and the Pulsar (a competitor to the VW Golf and Ford Focus) were exciting by any means. But at least they gave consumers an option to, you know, buy something that wasn’t an SUV. Options are nice and it seems like we’re getting fewer and fewer of them every year. Now it’s like you can have any car you want, as long it’s an SUV. Dieselgate! Does it seem like a never-ending problem? If yes, then you’ve got a pretty accurate feel for the situation. In terms of court fees alone, the automaker had allocated some $32 billion for settlements and damages, but it now faces more than $10 billion in further claims from pissed off investors and customers, reports Bloomberg. The legal wrangling kicked off on Sept. 10, almost three years to the day after the first revelations that VW had installed software designed to clean up the emissions from its diesel engines when the car was being tested. Officials in the city of Braunschweig, a half-hour’s drive from Volkswagen’s headquarters in Wolfsburg, had to construct a makeshift courtroom in the local civic center to accommodate the legions of lawyers, shareholders, and media expected for a €9 billion ($10.4 billion) lawsuit by investors who say they lost money because VW failed for months or even years to disclose the cheating. On top of all that, over 20,000 German VW customers are suing and looking for compensation. They claim that they’ve taken a hit on the resale value of their cars. All of those disgruntled VW buyers will soon be able to roll their complaints together into a class action suit, once Germany introduces a new law later on this year. Back in May, the German cabinet approved a consumer protection draft law that let “organizations to litigate on behalf of the consumers they represent,” which cuts down on the lofty legal fees that might intimidate people from seeking legal action, reports Reuters. A state-financed consumer protection group called vzbv said that it will show that VW, Audi, Skoda and Seat customers with the EA 189 diesel engines were “intentionally harmed” by the automaker, which used software that let the engines cheat emissions tests. Resolving all of this will definitely take years. It will be painful and tedious and very expensive. But it doesn’t do to just keep funneling money into Dieselgate, there’s a car company to run and a reputation to fix. Last year, Volkswagen said that it would put a huge investment toward electric cars. You know, to invest in the future and probably also to earn some good will from the general public. VW had originally earmarked the shift to battery power to cost 20 billion euros ($23 billion). Now Chief Executive Officer Herbert Diess says this won’t suffice, without providing a new figure. The company needs to reduce expenses more to be able to invest in future technology and weather crises, he said. Making cars is hard. And also expensive. Between the legal fees and this, it seems like Volkswagen is in an extremely tight spot right now. Faraday Future said in July that deliveries of its first car, the FF 91, would start this December. That date has since been pushed back, according to a company press release. The line is buried at the bottom of the release, but it reads, “The order book for FF 91 early users – aka “FF Futurists” – is open with first deliveries commencing during the first half of 2019.” There is no word on why. Still, though, the car is supposed to have over 1,000 horsepower, so there’s that to possibly look forward to. If it happens. Car dealerships in the Carolinas are hunkering down in preparation for Hurricane Florence, a Category 4 storm that’s headed straight for North Carolina. That means taking computers off the floor in flood-prone areas and putting new-vehicle inventory in secured locations, he said. At Team Auto Group in North Carolina, preparations began three days ago when the group reached out to peers in Florida, including some Germain dealerships in Naples, which got hit by Hurricane Irma last year, in order “to get out in front of this,” said Matt Raymond, Team Auto’s director of business development. Many dealerships learned about hurricanes the hard way last year during Harvey. It was a difficult time, but it also yielded some very useful experience that’s helping them get ready for Florence. Let’s hope that this one won’t be as bad. Neutral: Will You Buy a Faraday Future Car?